The ability to accumulate and store large amounts of goods is a key feature of complex societies in ancient times. Storage strategies reflect the broader economic and political organization of a society and changes in the development of control mechanisms in both administrative and non-administrative—often kinship based—sectors. 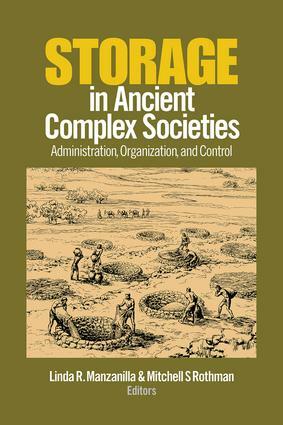 This is the first volume to examine storage practices in ancient complex societies from a comparative perspective. This volume includes 14 original papers by leading archaeologists from four continents which compare storage systems in three key regions with lengthy traditions of complexity: the ancient Near East, Mesoamerica, and Andes. Storage in Ancient Complex Societies demonstrates the importance of understanding storage for the study of cultural evolution. Linda R. Manzanilla is professor and researcher at the Institute of Anthropological Research of the National Autonomous University of Mexico (UNAM). She has participated actively in the formation of generations of archaeologists in the National School of Anthropology and History, Mexico. With a Ph.D. from University of Paris, she is author and editor of 22 books and 160 articles and chapters on subjects related to the emergence and change of early urban societies in Mesoamerica, Mesopotamia, Egypt, and the Andean Region. She has excavated in Mexico, Bolivia, Egypt, Anatolia, and Israel. Among her awards and honors are the Mexican National Academy of Sciences Award, Alfonso Caso Award (INAH), Presidential Award of the Society for American Archaeology, foreign member of the National Academy of Sciences of the USA, National University of Mexico Award in Research in Social Sciences, Foreign Member of the American Philosophical Society, member of El Colegio Nacional in Mexico, and Doctor Honoris Causa by UNAM. She has been member of the Committee for Research and Exploration of the National Geographic Society, and co-editor, with Gary Feinman, of Latin American Antiquity. Mitchell S Rothman is professor and chair of Anthropology and Archaeology, Widener University and Consulting Scholar at the University of Pennsylvania. He is author or editor of five books and over 50 articles on complex societies of the Ancient Near East and related topics. He has conducted field work in Armenia, Turkey, Iran and the United States.